Our annual “Report to the State” will take place April 10, 2019. If you are interested in being a part of the Michigan Crossroads Council delegation, please submit a video telling us a little bit about your Scouting journey and why you want to represent the Michigan Crossroads Council. Report to the State is your opportunity to meet with Gov. 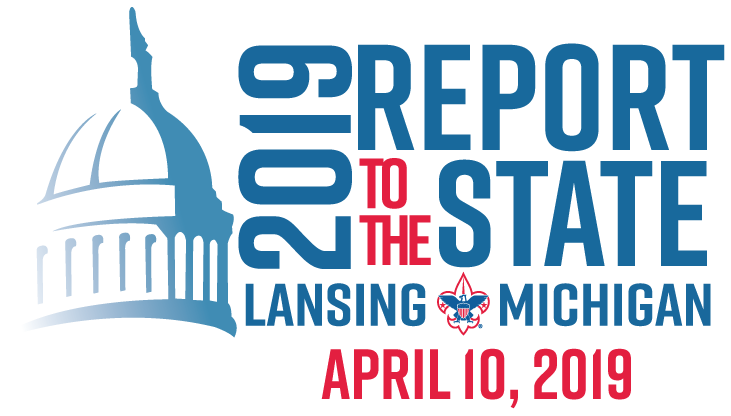 Gretchen Whitmer and other lawmakers at the State Capitol in Lansing to share an update about Scouting in Michigan and enjoy a day full of activities. Interested in being a delegate and representing the Michigan Crossroads Council? Submit your delegate entry online by March 18, 2019. The Report to the State Delegate submission is not longer available. Thank you for your interest. Q. How are delegates selected? A. Delegates are selected through a competitive process using an online form for their submission. Q. When will delegates be selected and notified? A. After review of submissions, delegates will be selected and notified by March 30, 2019. Q. What other requirements are there for the selected delegates and parents? A. Delegates and parents will also be required to participate in conference calls with Michigan Crossroads Council staff. The purpose of the calls will be to (1) share updates and reminders and (2) share schedule and other important details regarding the day. Q. How many delegates will be selected? A. Sixteen delegates representing each of our programs: Cub Scouting, Scouts BSA, Venturing and Exploring will be selected from across the state. A. Yes. All participants and parents will be provided lunch at the event. Q. When are submissions due by? Q. Will parents or guardians of selected delegates participate? A. Yes. Parents will be invited to participate along with their son or daughter. Due to the capacity of some venues or offices, parent or guardian participation may be limited due to venue space. Q. Will my son or daughter need a complete BSA uniform? A. Yes. Each of the participants selected as a delegate will be required to wear the complete BSA uniform including Scout shirt and Scout pants. Q. How long will the event last? A. The current schedule is that the event will last the entire day. A more detailed scheduled will be provided to delegates and parents. Q. Will my son or daughter need permission to be released from school or work? A. Most likely you son or daughter will need permission to be released from school or work. Michigan Crossroads Council staff will assist your son or daughter to gain necessary permission to attend this educational activity.